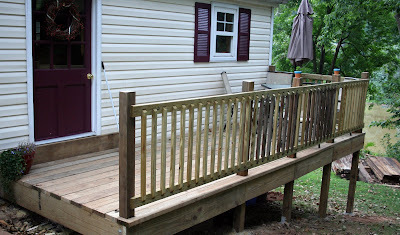 Country Mouse Tales: The Deck:Phase 1 Complete! This weekend we finished the first phase of our deck. I am using the term 'we' pretty loosely here, as Matt, Tim, and Brandon actually did most...Okay - all...of the work. 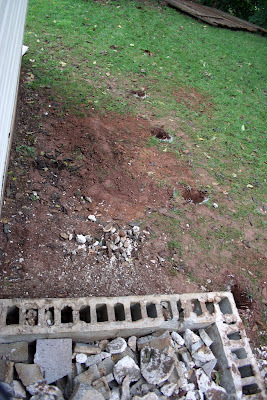 Here is what we started with, basically you are seeing a hill, some dirt, and some old concrete block...HOW LOVELY! 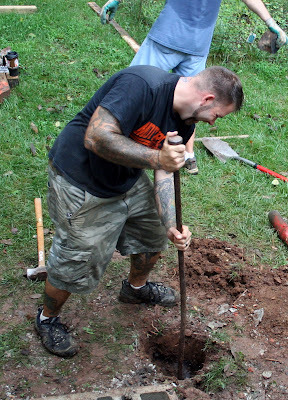 The boys (including my annoying ol' brother in law Brandon) dug holes for the footers. Is he laughing here?? Get to work! There is no time for laughing Brandon! I tell ya...that guy is always goofing off! Good thing I was there to lay down the law! 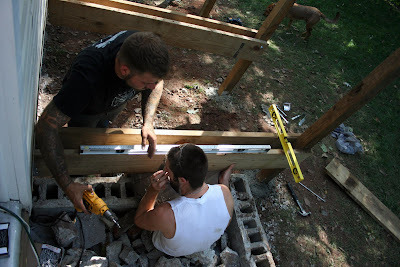 After we rid ourselves of the snakes, the boys set the footers in concrete, and went about putting up the frame for the deck...at least I'm pretty sure that's what they are doing here! All I know is...we ended up with this! And I love it!! 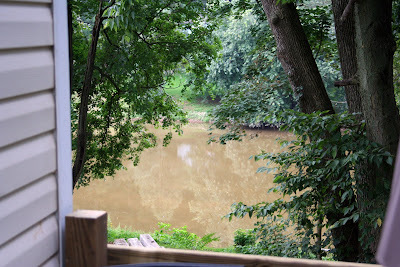 Check out our awesome view from OUR NEW DECK! (Can you tell I am excited!? Cause I really really am!) The creek is a little muddy right now, but still, it can't be beat. A few days ago we had a white heron standing in our back yard. OUR BACKYARD! Now Matt and I need to decide on a stain...any suggestions? So far we have come up with "something dark-ish"...so we could use all the help we can get in that department! Do you think something like this would be too dark? Do you think something lighter is in order? More red? Should we just paint it purple for kicks? Oh that looks fantastic! So nice! 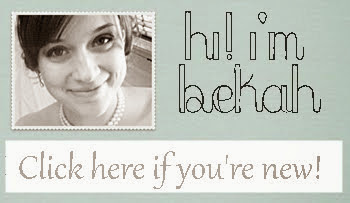 Beeeeeka!!!!!!!!! I love it!! SOO beautiful! AND THE SHUTTERS AND DOOR IS SOOO PRETTY! Aww little homemaker! Now you guys need to come over to a little cookout! Since we have a real table and chairs instead of the wobbly tables! 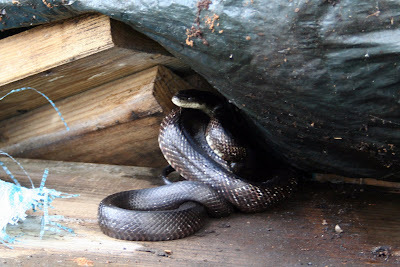 Those are some mighty big snakes (they don't bother me, as long as they aren't venomous). 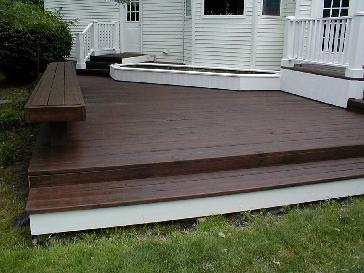 Your deck looks SO PRETTY! Wow... those ARE big snakes! What kind were they? I think the dark stain would look nice, just be careful what color you get. I know Mr. C's mom got a dark stain and it looked sort of cheap!! That deck looks fantastic! I think it would look nice with some varnish instead of stain... Or just leave it to go grey naturally with age. Love the deck! I think something dark would go well with the color of your shutters and door. You keep the snake....but send those boys over for a deck building session at my house!